As parents, we want to build and maintain strong relationships with our children. We want them to find us trustworthy and supportive, nurturing and wise, generous and attuned. One of the best tools we have for succeeding in these goals is our ability to listen to our children. Unfortunately, most of us don’t listen as well as we could (or even think we are). While many behaviors keep us from fully hearing our children, I will focus on three I most commonly witness in my coaching work, as well as practices you can take to remove these and other barriers to become a better listener with your children. First up may be parents’ hardest behavior to change: advising. Instead of listening with no objective in mind, when we’re in advising mode, we’re listening for the information we need to be able to solve the “issue” our child is facing. While part of our brain is taking in what our child is saying, another portion is busy formulating useful solutions to her situation. 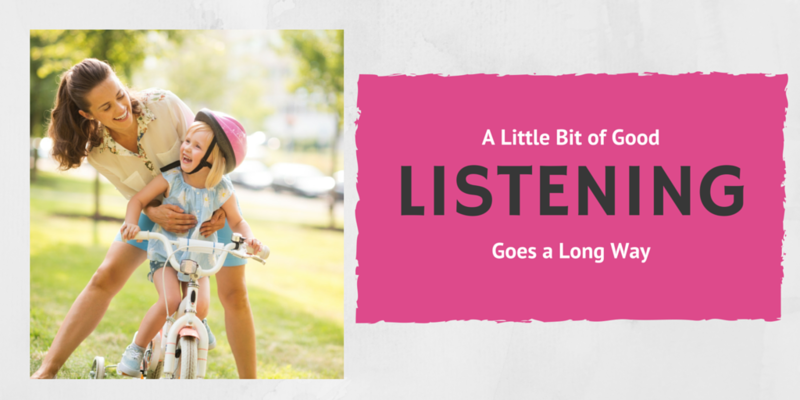 At best, we’re hearing just a portion of what our child is telling us because we’ve already decided what the purpose of our listening is. The intention behind this listening barrier is noble: we want to help our daughters and sons. As older, and sometimes wiser, humans, we are confident that offering our own perspective or life experience will prevent our children from making similar mistakes, enduring similar hurts, or otherwise having a less-direct route to their desired destination. Just because our child is telling us about a problem, however, doesn’t mean advice is what she desires. Nor is it necessarily what she needs, even if it’s what she wants. Fixing is a form of judgment. All judgment creates distance, a disconnection, an experience of difference. In fixing there is an inequality of expertise that can easily become a moral distance. Fortunately, there are some simple practices you can take to pause your advice-giver-parent-self so that your openly-listening-parent-self can shine. Listen with no agenda in mind. Do your best to fully hear whatever your child is telling you. Stephen Covey’s teaching of “seek first to understand” may have evolved from his observation that “Most people do not listen with the intent to understand; they listen with the intent to reply.” When your daughter hops in the car after school and complains about her day, resist the urge to offer “helpful” suggestions. Instead, pretend you’re a sponge whose purpose is to soak in this girl’s full communication. Partial listening is another common behavior that prevents us from fully hearing our children. Maybe we’re in heavy traffic and need to devote more attention to driving than listening. Perhaps we’re engrossed in cleaning our email inbox when our daughter plops down on the couch and starts talking, or we might simply intend to send a “quick” email to our boss while our child is “mindlessly” chatting to us at the breakfast table. Though not every exchange with our children demands single-minded focus, deeply listening to our children is one of the ways that we foster a sense of trust and care upon which a healthy long-term relationship is built. If you find it difficult to give your child your undivided attention, experiment with these three practices. Slow down and simplify. For many parents, the fullness of life is one of the main barriers keeping them from deeply listening to their children. When we are rushing from one activity to the next, always tending to a task on our agenda, or absorbed with thoughts about what’s just happened or what’s coming down the pike, we don’t have the mental space required for good listening. If you’re feeling squeezed by life’s demands, saying “no” and creating breathing room may be the first step to take in being able to listen to your child. Create a listening-friendly environment. Good listening begins with an intention to listen and having the space in which a conversation can easily take place. Minimize distractions – mute that phone, turn off radios or TVs, ideally be alone with the person you want to hear – and set aside time to be uninterrupted. Bottom line: when your goal is to listen you don’t multitask. By creating a listening-friendly space you demonstrate to your children that being able to hear them and have time to talk with them is a priority for you, which can make it easier for them to open up. Keep certain times devoted to listening. Beyond the act of creating listening-friendly environments, you can foster connecting conversations by having times that center around listening. In my family, two favorite times are bedtime and waking time (before the brain fully disengages from the sleep and dream world). NPR radio promotes their shows as inducing “driveway moments” where you stay in your car just to hear the end of a story or interview. You can apply this to listening to your children. Instead of jumping out of the car when you reach a destination, take a couple of minutes to listen to your child and connect before going on to your next activities. Sometimes our ability to listen is compromised by our emotions. One day, for instance, my daughter was telling me that she “hated” a girl at school. “Yikes!” my internal voice cried. “My daughter can’t hate someone. That’s not the kind of child I have!” If I had heeded that inner critic, it would have been easy to stop listening, demanding instead that “You don’t hate her!” or insisting that she not say such harsh things. Listening well can mean listening through such discomfort and restraining our automatic impulses to teach, correct, moralize, explain, rationalize, or minimize. The dominant culture tells us that parents know more than children and that our parental duty is to teach our children. While there is some truth in both of these ideas, they nonetheless inhibit our listening well. Listen earnestly to anything [your children] want to tell you, no matter what. If you don’t listen eagerly to the little stuff when they are little, they won’t tell you the big stuff when they are big, because to them all of it has always been big stuff. To break the hold of these cultural myths we can employ a few different techniques. Notice and set aside your own internal blocks. If you succeed in being a trustworthy listener for your child, chances are that you will eventually hear something that triggers you. Maybe your son describes “hating” someone, as my daughter did. Perhaps your daughter tells you that someone has been bullying her at school. Or maybe your discomfort arises when your children are telling you about what your former spouse said about you.Whatever the situation, we enhance our effectiveness as a listener when we recognize that we’ve stopped listening and can put aside whatever has gotten in our way and begin listening again.If you pause periodically to reflect back to your child what you’ve heard them say, it can help prevent you from getting distracted. You might also experiment with the practice of internal dialogue when you’re zoning out. “I’m feeling anxious about what Sam is telling me,” you might say to yourself, taking a deep breath as you do so. By simply acknowledging your own emotions, you can often keep them from overwhelming you and pulling your attention from your child’s story. Listen first to understand and reflect that understanding back to your child. When understanding is our first goal of listening, our other motives may be less likely to kick in. Yes, we may discover something we want to teach our child. We might even realize that our child has misinformation. By listening fully with a broad objective of “understanding,” we can take in our child’s communication in a neutral manner. After listening, repeat back what you heard your child say. This lets your child know that you’ve heard her and also gives her a chance to clarify anything you misunderstood. Don’t fake listen. When your children need to be heard, do whatever is necessary to be able to hear them. That might mean asking for ten minutes to finish an important work task, or calming down from an upset before you sit down to listen to your child. Obviously, instances may arise when the time to listen is NOW, but in most cases an important conversation can be postponed a few minutes or more. It’s better to take the time to really hear your child than to half-listen right away. The first option shows that you truly want to hear what your child has to say. The second communicates that you’re willing to pretend just so you can move on to the next task on your list.Don’t be afraid to pause during listening to your child if you notice you’ve gotten distracted or are otherwise inhibited from truly hearing what they’re saying. Tell your child, “I notice that I’m having difficulty hearing you right now. Let me take a few breaths to come back to myself, then you can continue talking.” This is perfectly acceptable and preferable to zoning out and missing what they’re telling you. Listening is an art. It uses not only our ears, but our eyes, hearts, and intuition when done well. Hearing our children is about setting our own agendas aside, making space for them to fill with the stories of their life experience. When we listen fully, we offer our children a tremendous gift and strengthen the bonds of our relationship. While it isn’t always easy to listen well, using the practices suggested above can help us eliminate the listening blocks that most commonly arise. By creating an intention to understand our children, focusing our attention on them when they speak, and listening with openness to what is being said, we will earn our place at our children’s side as one of their most worthy confidantes.